We are Uttar Pradesh, India based Manufacturer & Supplier of Gray Fabric! The Gray Fabric we offer is a raw material, before printing of covers, and available with us in ample of color and other related specifications. Talk of its price; buyers can stay completely assured to get it from us at the best market prices! 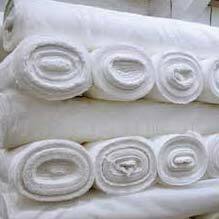 Over the years, we have been processing small as well as bulk orders of Gray Fabric with the surety of safe and timely deliveries.